from 40 pcs. 0,21 EUR ea. from 80 pcs. 0,19 EUR ea. from 160 pcs. 0,17 EUR ea. 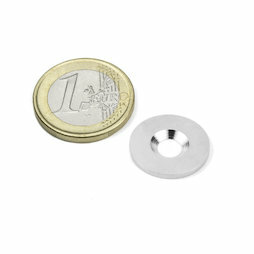 These metal discs are suitable as base surfaces for our magnets, e.g. disc or hook magnets. 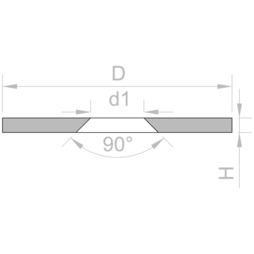 They can easily be screwed onto non-magnetic surfaces with a countersunk screw. The metal discs are not rust-proof and therefore not suitable for outdoor use. 5 pcs. 1,72 EUR ea. 5 pcs. 2,09 EUR ea. 5 pcs. 1,16 EUR ea. 5 pcs. 1,21 EUR ea. 5 pcs. 1,69 EUR ea. 5 pcs. 2,19 EUR ea. 10 pcs. 0,71 EUR ea. 5 pcs. 1,90 EUR ea. 5 pcs. 1,93 EUR ea. When using countersunk bolts with the ISO standards 7046-2, 14581 and 10642, be aware of the following: If you want to screw the metal disc to a stainless steel surface, you need to lower the borehole so the countersunk bolt can be screwed on flush. These metal discs are not rust-resistant and therefore not suitable for outdoor use.